In July 2017, The Hillsborough Street Community Service Corporation (HSCSC) in partnership with the City of Raleigh and NC State University commissioned Kimley-Horn and Associates, Inc. to develop a Park+ model for the Hillsborough Street corridor. 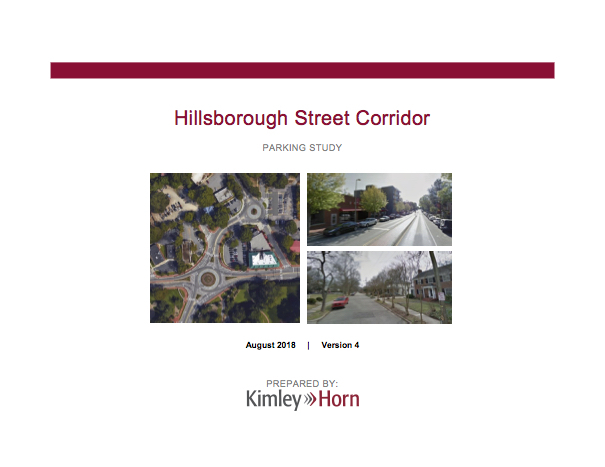 The purpose of this study was to address a decades old perception that parking is both challenging and detrimental to the growth of the Hillsborough Street corridor. Numerous surveys and business outreach efforts have listed parking as the primary challenge to business success along the corridor. Through the analysis of data, outreach to stakeholders, and prediction of parking demands along the corridor, this study aims to identify short, medium, and long term solutions to lessen this parking challenge. The study area for the Hillsborough Street component of the model is generally bounded by Mayo Street to the east, the railroad tracks and Hillsborough Street to the south, Beryl Road to the west and Clark Avenue and Everett Avenue to the north. The assessment also includes the NC State campus south of Hillsborough Street. The modeling for the campus was completed prior to the initiation of this project and serves as the foundation for the expansion into the Hillsborough Street area. 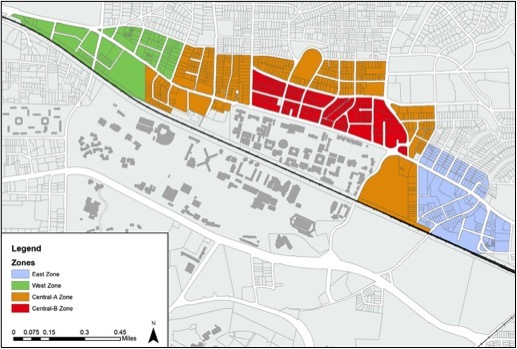 As part of the study, Kimley-Horn, assisted by North Carolina State University, collected existing occupancy data along the corridor. This data was used to model existing conditions as well as several future scenarios. To understand parking at a more granular level, the study area was split into four zones: the West Zone, the East Zone, the Central-A Zone and the Central-B Zone, as shown in the map below. "Parking Study Area - Parking Study"
On-street parking throughout the entire study area (including residential and paid street parking) is 46% occupied. Public off-street parking is 68% occupied. Private off-street is 38% occupied. Despite the overall appearance of parking availability based on the above data points, the core portions of the study area around Hillsborough Street, Oberlin Road, and Dixie Trail experience excessive public parking demands around the restaurant, retail, and office uses in this area. Parking in the core area is also constrained by a lack of available public parking off-street. Most, if not all, of the spaces within a proximate walking distance of Hillsborough Street are private in nature, serving only the businesses that provide those spaces. In many cases, these spaces are regularly underutilized, but because of the restricted nature of the spaces, they are unavailable to the patron wishing to access businesses along Hillsborough Street. This, combined with the high demand for the limited public spaces that are available, creates a localized parking challenge that limits effectiveness of finding parking in the most desirable portion of the corridor, further fueling the perception of a lack of parking. NC State’s North Campus, which borders Hillsborough Street, has very high demand which often spills over onto the Hillsborough Street corridor and the surrounding neighborhoods of the Central-B Zone. In total, Central-B’s on-street and public off-street are 61% and 72% respectively occupied, with Hillsborough Street itself more than 75% occupied. 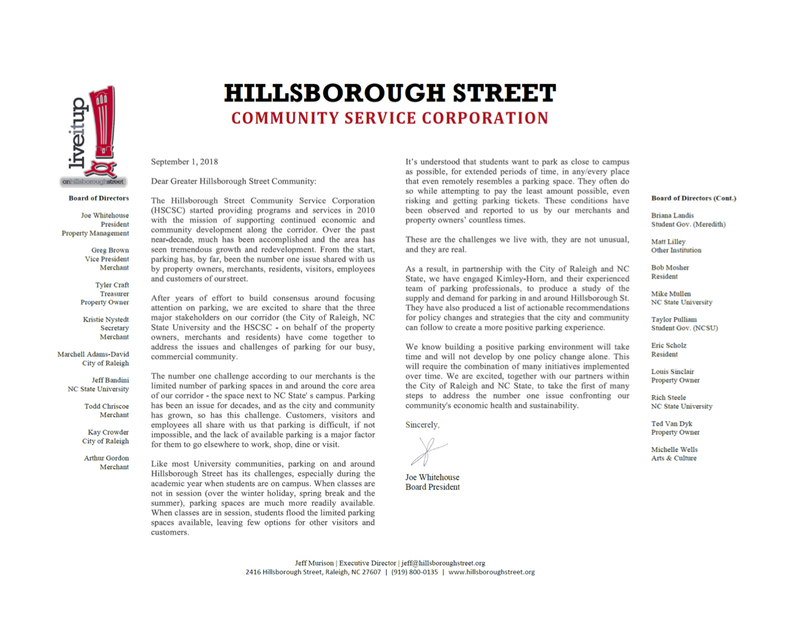 "HSCSC Foreword Letter - Parking Study"
To read more download the full report.